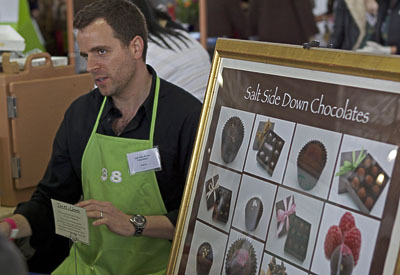 When you have to compete with over 30 other quality chocolate vendors in a single venue, you need a way to stand out. 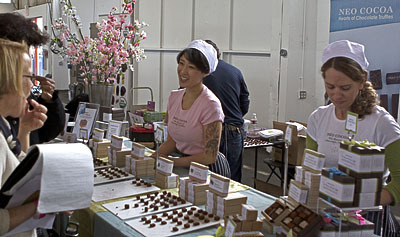 At the 2011 SF Chocolate Salon, it seemed like many chocolatiers were showcasing unusual ingredients (like durian or anchovies) or spicing chocolates with peppers (salt is so last year). Passion fruit was a popular fruit flavoring, and teas were big too. Sadly, at least for me, there was no peanut butter in my chocolate samples this year. It was still a worthwhile excursion for me and the other chocolateers at CBTB. 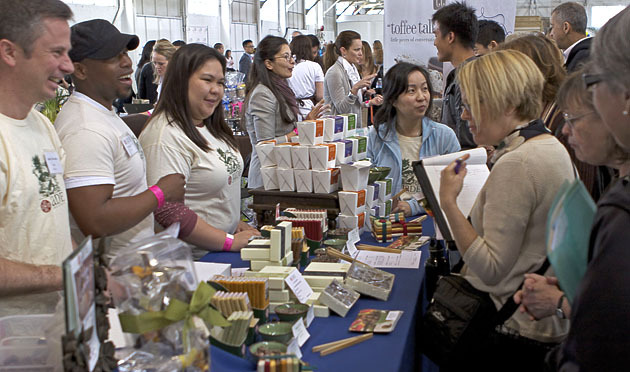 Salons are unique events with many small vendors who often don’t have regular retail spaces. If you’re interested in high-quality chocolate, a salon is a cost-effective way to try a lot of different chocolatiers’ wares to find the ones you like. Then you can order their chocolate online or seek them out at local farmers’ markets and some select retail establishments. And with show-only specials, seasonal ingredients, and experiments that may never get produced after the event, they are also a good way to experience more established chocolatiers. This year I was asked to be a judge, so I made an effort to try more chocolate in one day than ever before (and that includes every Halloween and Easter growing up). From that concentrated tasting experience, I want to fill you in on some of the good stuff you missed if you weren’t there this year. And if you’re lucky, you’ll be able to find the real thing near you or on the vendors’ websites. All of the chocolatiers mentioned here are local, and I’ve included a list of SFBA vendors and their awards breakdown at the end of this article. Sampling new truffles at the Jade booth and searching for words to describe the Bogart truffle. Socola Chocolates was the one to beat when it comes to unusual flavors this year. They were showcasing their new Dangerous Durian and Sriracha Flying Rooster truffles. Durian is a delicious tropical fruit with unfortunate overtones of sulfur. Many people find it gag-inducing, others don’t seem to taste the sulfur at all. I am somewhere in the middle. I think durian smells like rotting garbage, so I would never buy the giant knobby fruit itself, but the truffle was tasty — until I hit the sulfur middle taste. Edible, but not totally enjoyable to me, so I’d pass on these. But if you are one of the lucky ones who doesn’t taste the sulfur, it is otherwise a nice tropical fruit flavored chocolate that is not passion fruit. And if you love, love, love durian, they also make a Durian Easter Egg, a 2″-3″ long durian-filled chocolate egg. Continuing their I-Dare-You theme this year, Socola’s Sriracha Flying Rooster mixed Sriracha hot sauce and mango in a truffle. Sriracha is a familiar condiment in SE Asian restaurants and is made with chili peppers, distilled vinegar, garlic, sugar and salt. Wrapped in chocolate, the first taste blast was garlic, followed by hot. I didn’t taste the mango, it was out-muscled by the Sriracha. If you like peppered chocolate and are looking for something stronger, Srirachi Flying Rooster should do the trick. Andrew of Salt Side Down explains what’s in their No #5 umami truffle. Nothing epitomized umami like their Number 5 chocolate: A 72% cocoa ganache flavored with a variety of savory ingredients such as anchovies, olive, Parmesan, and garlic. (I am not making this up.) This umami-forward ganache is covered in dark chocolate and topped with sea salt and roasted sesame seeds. The unusual ingredients added not only their unique flavor, but also a different texture, slightly more chewy than smooth. It’s like the entrée course of chocolates. But what I really liked was their Sweet Fungus Among Us, a single-origin Hawaiian milk chocolate ganache with Candy Cap mushrooms steep in cream, that deliver naturally sweet maple syrup flavors balanced with an earthy umami undertone, in dark chocolate topped with soy sauce infused sea salt. Very tasty with a nice lingering slightly sweet yet savory end taste. 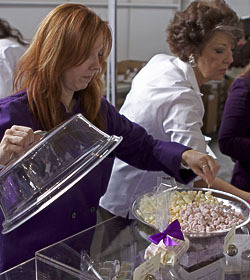 Anni of Gateau & Ganache offered samples of her handmade marshmallows along with several new flavors of bonbons. Anni Golding, the original flavor-bomb chocolatier, continued her emphasis on fruit and chocolate pairings at the Gateau & Ganache Fine Chocolates & Confections booth. The flavor intensity of her chocolates approaches shock & awe, but never overwhelms. Instead, as she has said before, she aims to make the flavor distinctive enough so you don’t have to go back to the box to discover what you just ate. Her new flavors at the show included a lime & tequilla bonbon that uses Tres Agaves Blanco tequila and is topped with a dusting of lime zest and salt. The combo created a burst of lime nicely balanced with the chocolate. She also debuted a sour cherry caramel in a 64% African origin chocolate, which was a liquid caramel with a light cherry taste. It’s one of 4 new fruit caramels in single-source chocolate that make up her Spring 2011 caramel collection, which also includes the Caramel à l’Abricot-Passion at the show, an apricot/passion fruit purée in a 66% Ecuadorian chocolate shell. Coming soon is a lemon/lime in 72% South American chocolate, and a raspberry caramel. Check her website for updates. Another great fruit-based chocolate I tried was Coco Tutti‘s fig with roasted walnuts bonbons. Elyce Zahn explained its genesis came when she fell in love with some fig products at the SF Fancy Food Show. “As soon as I tasted it, I thought walnuts,” she explained, and her fig with roasted walnuts bonbons were born. They had a buttery, strong fig flavor complimented by the 45% Valrhona chocolate shell, which allowed the fig flavor to come through. I love Elyce’s chocolates. She makes her own preserves and other flavorings, and her chocolates have a slightly rustic, wabi-sabi vibe. I think they should be served on handmade pottery. They taste great too: Her Florentine had a nice citrus scent from grated lemon and orange zest added to the roasted nuts. Her non-dairy selection (and she always has one) was a raspberry truffle that used an organic chocolate from TCHO and had a strong fruit flavor from the raspberry confit she made herself. Her ginger bonbon used a Quevedo 65% Cacao chocolate from Guittard. She also offered a liquid vanilla caramel made with Irish butter, which has a higher butterfat content than American butters, so it’s smoother and creamier. Dolce Bella Chocolates uses their own garden produce in their chocolates, such as the Meyer lemon bonbon, with no preservatives or extracts. 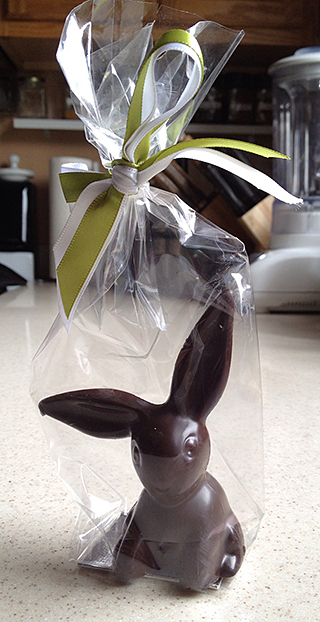 Because their chocolates are seasonal, you never know what you’ll find. At the show, I tried their peppered rosemary orange, chocolate mint and sweet caramel. Everything tasted very fresh, but I liked the chocolate mint best. 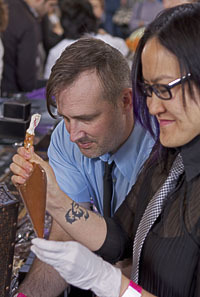 I-Li of Vice Chocolates makes chocolate caramels on the go, while Sean sets out samples of their new truffle. Vice Chocolates combined fruit with tea in a new truffle at the show: Sadako, which was Matcha green tea and yuzu (an East Asian citrus fruit). It had a very bright flavor and was beautifully hand decorated (as are all Vice chocolates) with a gold ring (Sasako is a character in the Japanese “Ring” series of movies). Vice chocolatier, I-Li Brice, was also creating just-in-time caramels, squeezing flavored caramel onto dark chocolate squares. The chipotle caramel ended with a nice warm sensation that flirted with hot. The pear, ginger & galangal, made with 2 types of ginger, had a nice bite. The sting of the fresh ginger root was balanced with the floral note of the galangal (AKA blue ginger). Jade Chocolates, well known for their chocolate bars, featured their new line of tea flavored truffles at the show, and announced that they are opening a tea & chocolate store with Leland Tea Company in Summer 2011, Rue du Thé, in Burlingame. The Chai tea truffle was very cinnamon-y and yummy, but I was blown away by the Bogart tea truffle. It’s hard to describe the taste, but it’s like a taste beyond chai with a similar spice combination but some extra special something that reminded me of childhood holidays – Christmas spices, vanilla and butter, wrapped in chocolate. Does not get better than this! New to the show, Nicole Lee Fine Chocolates has been in business 1 year. Nicole graduated from the Cordon Bleu culinary school in Paris with a degree in pastry making. At the show, she was offering artisan chocolates and French macarons. Located in San Jose but without a storefront as yet, her wares are delivered locally free of charge. One of the difficulties the husband-and-wife team have found in selling their chocolates and cookies is that stores are reluctant to carry them because they contain no preservatives, and so are highly perishable. In fact, they should be consumed within 1-2 weeks of manufacture. They do have an online store. We tried their Muscadine and Les Paves truffles, which are small bites of lightly flavored chocolate. They could be addicting with the Muscadine’s smooth orange Grand Marnier taste and the Les Paves’ whiskey deepening its dark chocolate flavor. We also tried the Pandan Coconut, which were very smooth (no flakes) with a good chocolate flavor and a lingering coconut aftertaste that wasn’t overwhelming. At Neo Cocoa‘s booth, Christine Doerr presented a complete run of her French-style truffles made with 72% cacao, Straus Family cream and other local and/or organic ingredients. A new flavor at the show, cool peppermint, was a nice bright peppermint with a smooth texture, which was a pleasant surprise as the last peppermint bonbon I tried (artisan, but not local) was kind of harsh and chalky. Christine is also working on a new line of salted truffles, inspired by the success of her very smokey Almond Butter & Smoked Sea Salt truffle. Neo Cocoa is now available at Bi-Rite. Kika’s Treats, in business for 5 years, was born in La Cocina, a non-profit food business incubator in SF that helps low income entrepreneurs start and grow their businesses. At the show, they offered crunchy caramels in dark chocolate, a new product not available in stores yet, and other products in their product line. I tried the Brazilian Honey Cakes, which were not what I expected. Instead of a honeycomb candy, they were like little spice cakes covered in dark chocolate – delicious. Kika’s Treats are available online and throughout SFBA, including at Bi-Rite, Rainbow Grocery and Market Hall Foods (formerly The Pasta Shop). Patricia, who named the business, and Shelley, who came up with the idea. 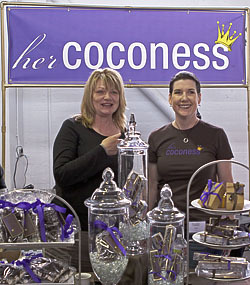 At Her Coconess Confections, Shelley Seward had samples of her caramels and rocky road. Her vanilla salted caramel is a chewy caramel with a subtle saltiness from its pink flake salt. Her espresso salted caramel added some new dimensions with caramelized cocoa nibs so you experience a crunchy chocolate first, then espresso at the end. Her bittersweet rocky road stands out because of its chewy homemade marshmallows, which have more of an earthy flavor than other marshmallows because they are made from an egg white base instead of the usual corn syrup base. Chocolate Covered is an SF institution well stocked with chocolate from all over the world, including local artisan chocolates. Unfortunately for me they were not giving out samples of local chocolates. Instead, they had a Spicy New Mexico Chimayo Red Chili & Roasted Pistachio Bark from Señor Murphy in New Mexico. Quite hot! Here’s hoping they met a lot of local chocolatiers they will add to their store along with stalwarts, Jade Chocolates, Poco Dolce, and Michael Misher . Finally, I wanted to mention some non-locals I was impressed by. Amano Artisan Chocolates has a range of single-source chocolate bars that is very distinctive. They go down to the macro-level and offer some single-valley-sourced bars. These would make for a fun and easy chocolate tasting party. Madecasse is a beyond-bean-to-bar company located in Madegascar that grows their own cacao, processes it into chocolate, and sells the bars. It’s all done sustainably by local African farmers and former Peace Corps volunteers. Momotombo Chocolate Factory is located in Nicaragua and aims to develop the local chocolate industry. They produce raw chocolate using local (Nicaraguan) ingredients. For now you can only buy the chocolate in Nicaragua (where they will do custom blends for you!) and at special events like the Chocolate Salon. Maybe even more interesting is the school that is attached to Momotombo: Ometeote Chocolate Workshops are available in the Bay Area as well as Nicaragua and cover topics such as ancestral and colonial chocolates of Mesoamerica with talks and hands-on demonstrations. See this year’s list of all award winners. Date posted: April 28, 2011. This entry was posted in Chocolate around the World, East Bay chocolate, Events, Local chocolate, Recommended chocolatiers, San Francisco chocolate, South Bay chocolate and tagged Amano Artisan Chocolates, anchovy, apricot, artisan, bergamot, Bi-Rite Market, business, butter, cacao nibs, caramel, caramels, chai, cherry, chipotle, chocolate, Chocolate Covered SF, Chocolate Salon, chocolatier, Coco Tutti, coconut, dark chocolate, Dolce Bella, durian, Earl Grey, East Bay, espresso, fig, galangal, garlic, Gateau & Ganache, ginger, Grand Marnier, Guittard, Her Coconess, International Chocolate Salon, Jade Chocolates, judge, Kika's Treats, lavender, lime, macaron, Madecasse, mango, maple syrup, marshmallows, matcha green tea, meyer lemon, mint, Momotombo Chocolate Factory, mushroom, Neo Cocoa, News, Nicole Lee Fine Chocolates, olive, orange, Parmesan, passion fruit, Pasta Shop, pavé, pear, peppermint, Rainbow Grocery, raspberry, rocky road, rosemary, Salt Side Down, savory, sea salt, sesame, Socola Chocolatier, soy sauce, Sriracha, TCHO, tea, tequila, truffles, umami, Valrhona, Vice Chocolates, walnut, whiskey. Bookmark the permalink.